Corrected Transcript and Commentary Copyright © 1995 by Eric M. Jones. Scan credits in the Image Library. Video credits in the Video Library. Except where noted, MP3 audio clips by Thomas Schwagmeier and video clips by Ken Glover. Last revised 16 May 2017. 128:25:59 Fullerton: Antares, Houston. Over. 128:26:05 Shepard: Roger. Good morning, good morning. Reading you loud and clear. How me? (Long Pause) Well, we're reading you loud and clear, Gordo. How do you read us? 128:26:34 Fullerton: I read you loud and clear, Al. Good morning. We had a little mixup on whether we're configured properly or not. I guess we are. You're loud and clear. 128:27:11 Shepard: We've had no medication and the shape of the crew is excellent. 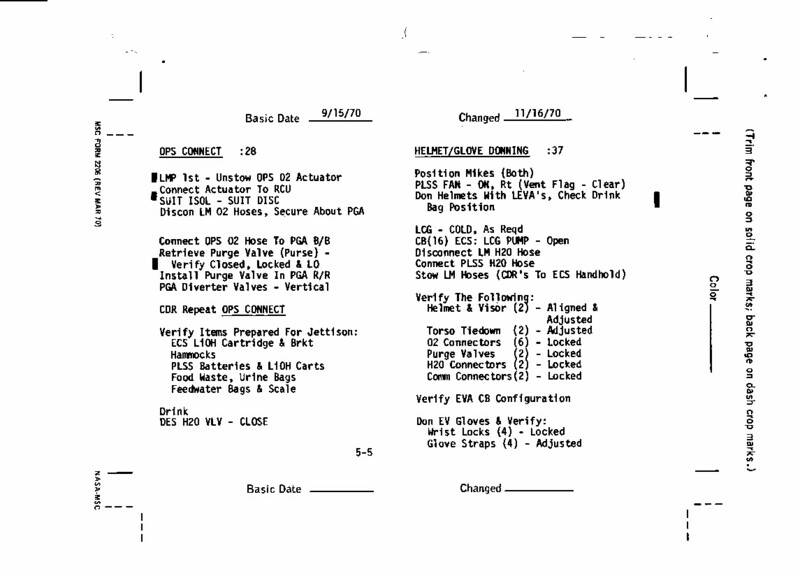 The PRD reading is as before: Commander, 16051; and LMP, 07049. 128:27:37 Shepard: And any time you want to give us the lift-off update and the consumables update, we're ready to go. 128:27:46 Fullerton: Okay. I haven't got that ready to go yet, Al. I'll call you when I do. (Long Pause) Antares, Houston. I have the consumables numbers for you. Over. 128:28:27 Shepard: Okay. Go ahead. 128:28:29 Fullerton: For a GET (Ground Elapsed Time) of 129:00 (128:20 transcript time); RCS A, 80 percent; B, 77 percent; Descent O2 is 66.7 percent; and Ascent N/A (meaning "not applicable") and slash 96 percent; Descent water, 40.7 percent; and Ascent (water) is 98.4/98.4 percent. (Pause) And the ... (Pause) Stand by one on the last. (Pause) The amp-hours (remaining) on the Descent Batts are 834; and, on the Ascent Batts, they're 572. Over. 128:29:43 Mitchell: Okay. I copy GET of 129:00; RCS of 80 and 77; O2, - rather, Descent oxygen, 66.7; ascent is N/A and 96; Descent water, 40.7; Ascent water is 98.4/ 98.4; ampere-hours remaining descent is 834; ascent is 572. 128:30:08 Fullerton: Readback is correct, Ed. Good morning. 128:30:17 Mitchell: Good morning, Gordon. How is it back in Houston this morning? 128:30:24 Fullerton: I'm not sure, Ed. I haven't been outside in quite a while. But we're wondering if you'd give us an estimate of your sleep there. 128:30:39 Mitchell: Well, not very much. I'd say four and one-half to five hours at the most. Been kind of dozing the rest of the time. 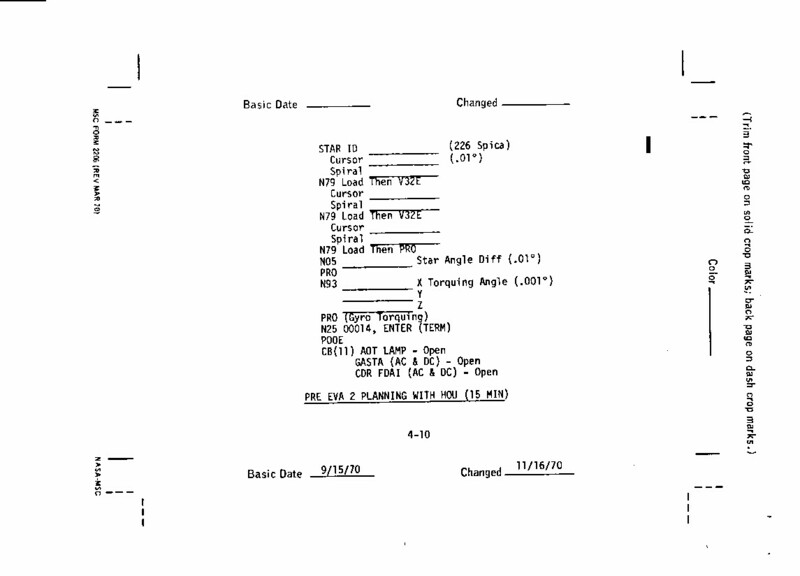 128:30:47 Shepard: And about four hours for the CDR. [I was under the impression that the neckrings contributed to the feeling they couldn't position their heads comfortably. In March 2005, I asked Ed Mitchell if this was true. He replied, "Yes, the neck rings were part of the problem as they were big, bulky and clumbsy. 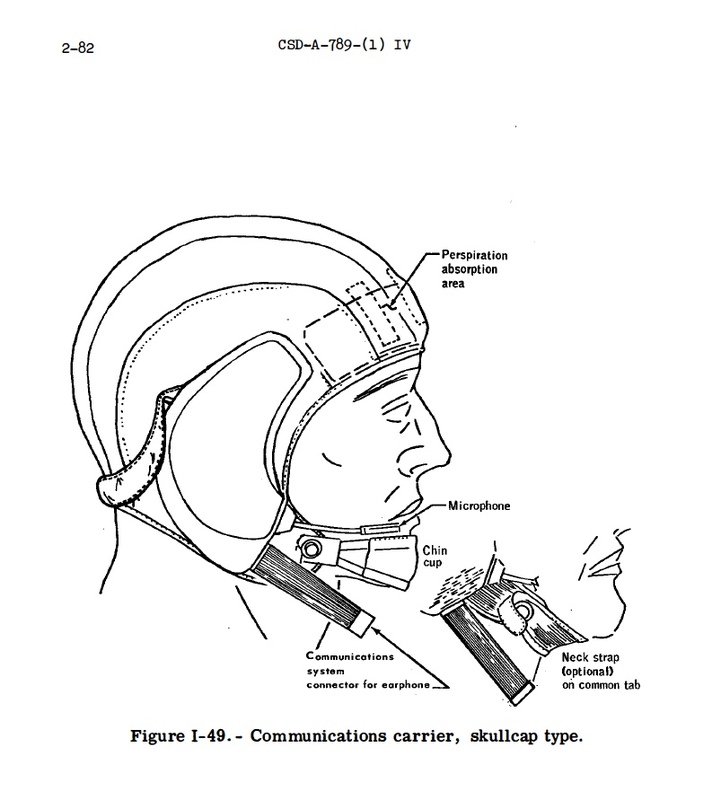 But a pillow or something to support the head in a more natural alignment with the spine was needed and fill the space between the neck ring and the head." 128:30:55 Fullerton: Antares, we still are showing the water separator speed off-scale high. And one question, they can maybe resolve the reason...On the lithium hydroxide canister, we'd like to know if the flow limiters are on those - on both the one you took out a short time ago, and the one that you put in. Did you happen to notice? 128:31:31 Shepard: That's affirmative. We had the Teflon flow limiters on both. 128:33:18 Mitchell: Okay, Houston. (As per Sur 4-7) I'm changing back to power (amp), primary, and Voice/Voice. 128:33:28 Fullerton: Ed, you were cut out there by another conversation. Will you say again, please? 128:33:36 Mitchell: Roger. I'm going to Primary Power Amp and back to Primary Voice. 128:35:42 Mitchell: Houston, Antares. How do you read? 128:35:46 Fullerton: Loud and clear, Ed. 128:35:51 Mitchell: Okay. There you are. We're ready to proceed with the IMU align (on Sur 4-8) if everyone's ready. 128:35:59 Fullerton: I'll check. Just 1 second. (Long Pause) Antares, Houston. 128:36:38 Fullerton: We'd like you to hold off for about 5 minutes on that, until we can give you an uplink, and that will result in a much better alignment. Over. 128:37:26 Fullerton: That's affirmative, Ed. Go ahead. 128:42:16 Fullerton: We're seeing a fluctuating signal strength. Like to verify that you're at Primary Power Amp and on the erectable. Is that correct? 128:42:28 Mitchell: That's affirmative, but let me check just a second. (Long Pause) I'm sorry, Houston. Do you read now? 128:42:48 Fullerton: Roger. Loud and clear. 128:42:52 Mitchell: Okay. As I went from Secondary to Primary, I never got past Off on the Power Amp. 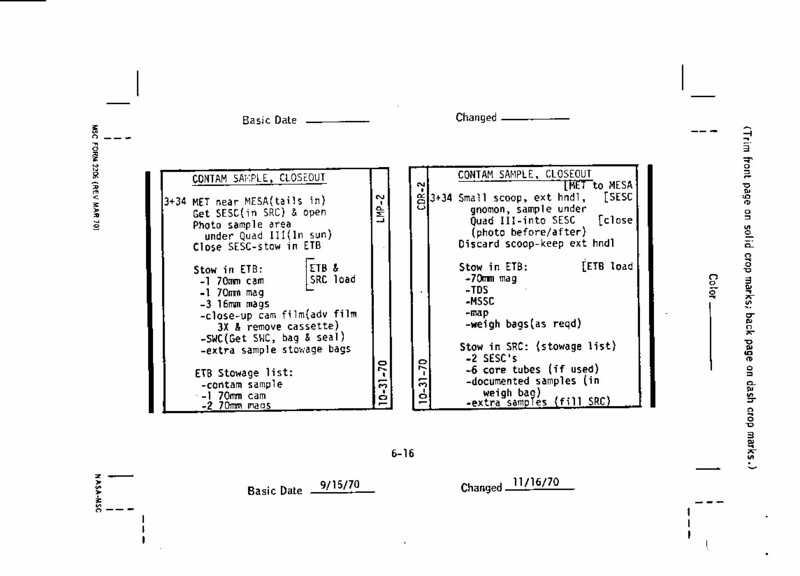 128:44:21 Shepard: Houston, we're in P00 and Data. Standing by (for) your uplink. 128:46:17 Fullerton: Antares, Houston. We're starting your uplink now. 128:50:09 Fullerton: Antares, Houston. The computer is yours and you're clear to do the P57 any time. 128:50:18 Mitchell: Okeydoke. Thank you, Gordon. 128:54:32 Fullerton: Antares, Houston. I have the Noun 34 number for you when you're ready for it. 128:54:42 Mitchell: Roger. Stand by one. (Long Pause) Okay, Houston. I assume you mean the lift-off table. Go ahead. 128:55:17 Fullerton: Negative. I meant the time you need about three steps more in P57 (that is, the third line in the center column of Sur 4-9), (the) Rev 31, lift-off time. I do have the table, if you want that one first, too. 128:55:30 Mitchell: Oh, okay. All right, go ahead and give this one. 128:55:34 Fullerton: Okay. The one for the P57, Rev 31 lift-off, 142:25:33.82. Over. 128:56:19 Shepard: Okay, Houston. Are you ready for Verb 74? 128:56:31 Shepard: Okay. Here it comes. 128:56:32 Fullerton: No. Not yet, Al. 128:56:40 Shepard: Okay. I'll stand by. Do it again when you're ready. 128:56:46 Mitchell: And I'm ready to copy the lift-off table. 128:57:54 Mitchell: Okay. 26 is 132:36:23; 27, 134:34:42; 28, 136:33:03; 29, 138:31:25; 30, 140:29:46; 31, 142:28:07. 128:58:16 Fullerton: That's all correct, Ed. (Long Pause) All right, Al, this is Houston. I guess we got that first Verb 74 you gave us, so we won't need another one. 128:58:52 Shepard: Okay. Very good. We'll press on with P57. 129:07:06 Fullerton: Couple of items. When you get to the point where you're cleaning and lubricating the PGA neckrings, wristrings, and so forth, we'd like to emphasize to you to take special care, especially with Ed's suit. Have you been briefed on the leak problem on Ed's suit? 129:07:28 Mitchell: We talked about it a little bit, but not in detail. 129:07:36 Mitchell: Let us finish this P57 and then we'll talk about it, Gordon. 129:10:04 Mitchell: You have it. (Pause; no answer) Houston, you have Down Voice Backup. 129:17:13 Cernan: Ah, good morning, Antares. Or good evening. How are you doing? 129:17:20 Mitchell: Pretty good. How are you? 129:17:23 Cernan: Real good. What can we do for you, Ed? 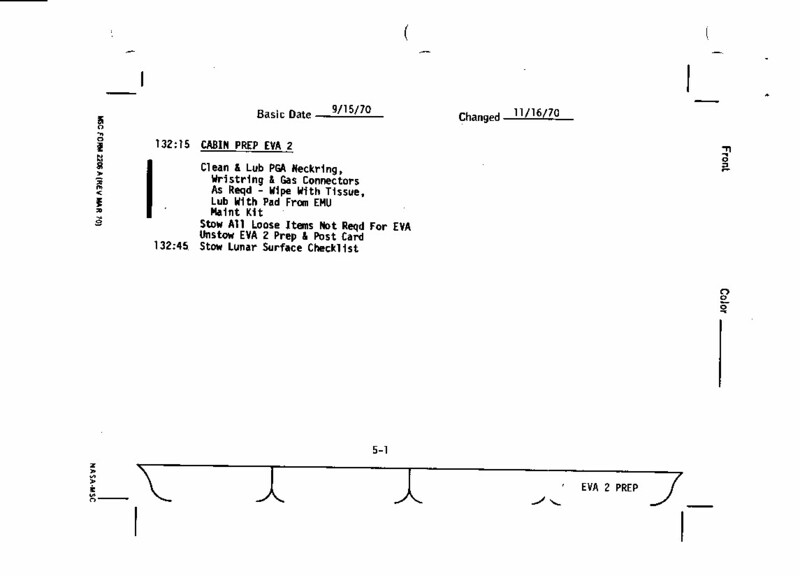 129:17:28 Mitchell: We were supposed to be picking up a pre-EVA-2 briefing (at the bottom of Sur 4-10). We're standing by. 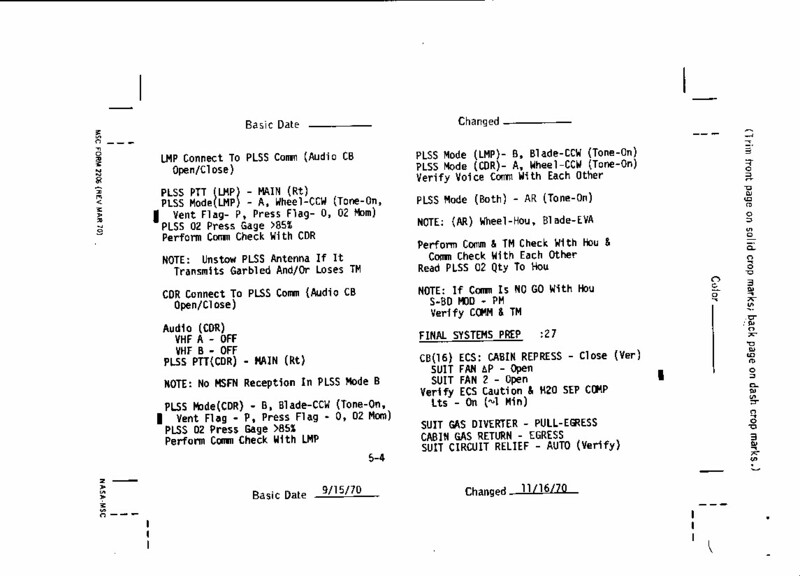 129:17:45 Cernan: Okay, tentatively, I think we're planning on - towards the end of your EVA-2, prior to ingress, (and) you can be thinking about this - going back and taking a look at the ALSEP antenna, but other than that at this moment there looks like there are no major changes. We'll get to you shortly. 129:18:06 Mitchell: Okay, Geno. How are things going there? 129:18:27 Shepard: Geno, if we're going to re-align the (Central Station) antenna, I'd just as soon do it at the start of the EVA. 129:18:35 Cernan: Okay. We'll make that input. You got any more comments concerning that, Al? You'd rather get it at the beginning, is that correct? 129:18:47 Shepard: That's correct. I think if we have to do it at all, then we'll go ahead and get it done right away because Ed can be doing something else while I'm doing that. 129:18:59 Cernan: Okay. I'll make that input, directly. 129:22:20 Shepard: Go ahead, Houston. 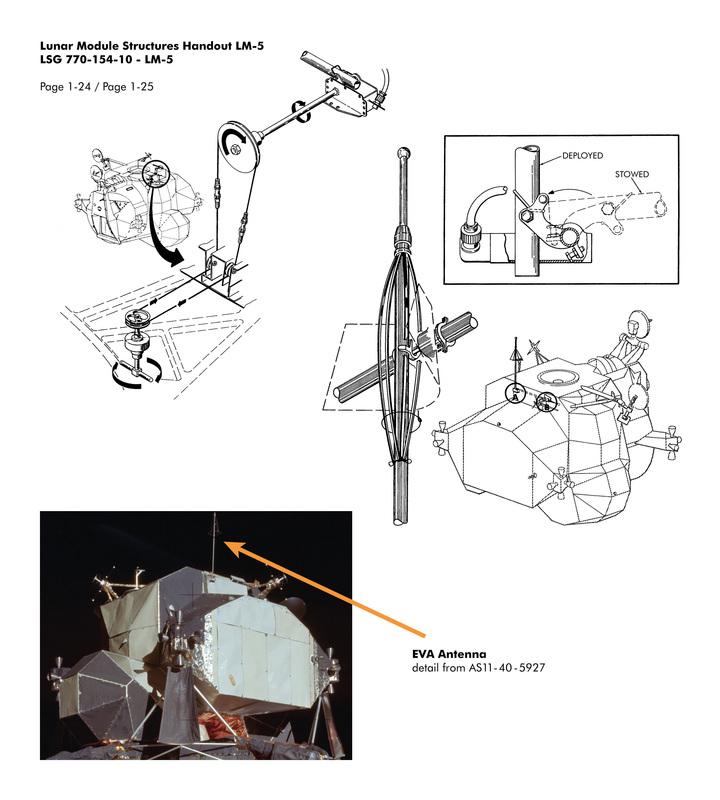 129:22:23 Cernan: How are you reading? 129:22:29 Shepard: We read you loud and clear. 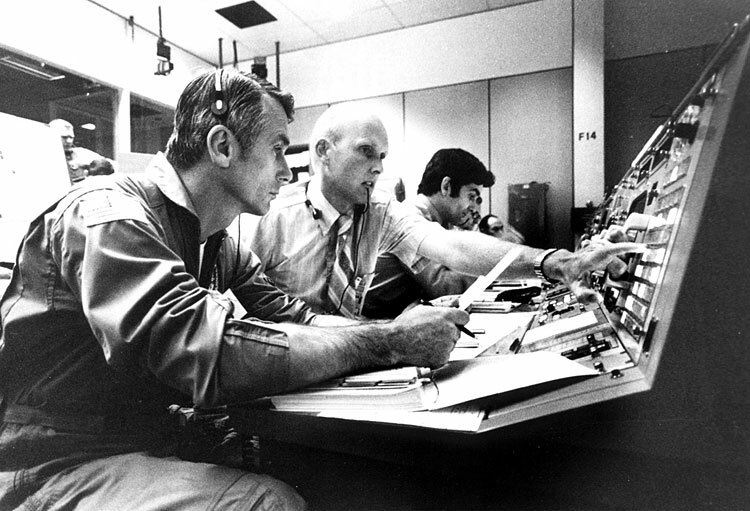 129:22:30 Cernan: Okay, Ed...(correcting himself) or, Al. We're taking a look at your overall comm, matching signal strengths and what have you. We're interested in what Power Amp you're using right now. What's the position of your Transmitter/Receiver and what antenna you're on now. We'd also like you to give us what those positions were during your sleep period, if you remember. 129:22:56 Mitchell: Okay, Geno. We're on Primary/Primary Down-Voice Backup, and the only difference is we were on Secondary/Secondary Down-Voice Backup, I believe. Yeah, we've been on Secondary Transmitter/Receiver. It called for Secondary Power Amp; and we were on Down-Voice Backup. And we've just gone to Primary Transmitter/Receiver as per checklist, and Primary Power Amp, a few minutes ago. 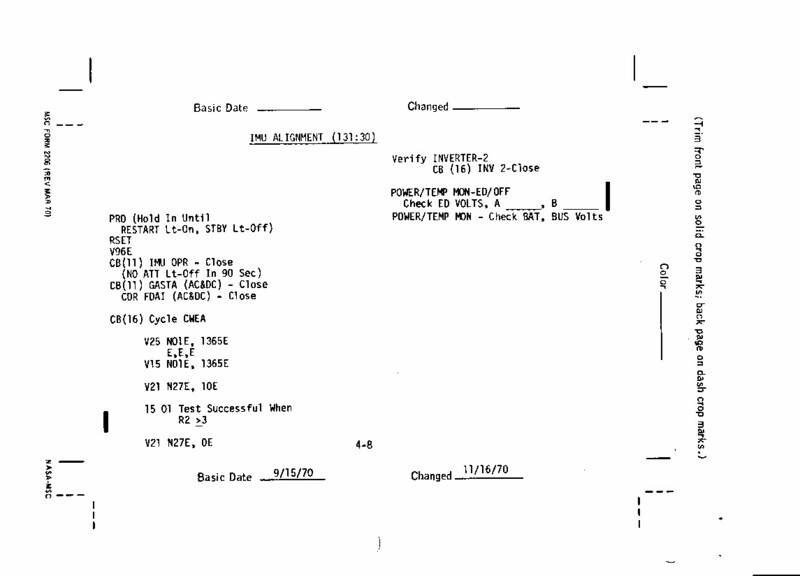 129:23:35 Cernan: ...the whole time. 129:23:40 Cernan: Okay. Thank you, Ed. 129:23:43 Mitchell: Let's see if what I'm telling you is correct. Let me flip back here. (Long Pause) Okay, Gene. I was wrong on that. We went to Off on the Power Amplifier as per checklist when we went to Down Voice Backup during the sleep period and we came back up to Primary as per checklist this morning. I was thinking that we were in Secondary, but we did go by the checklist, so it had to be Off. 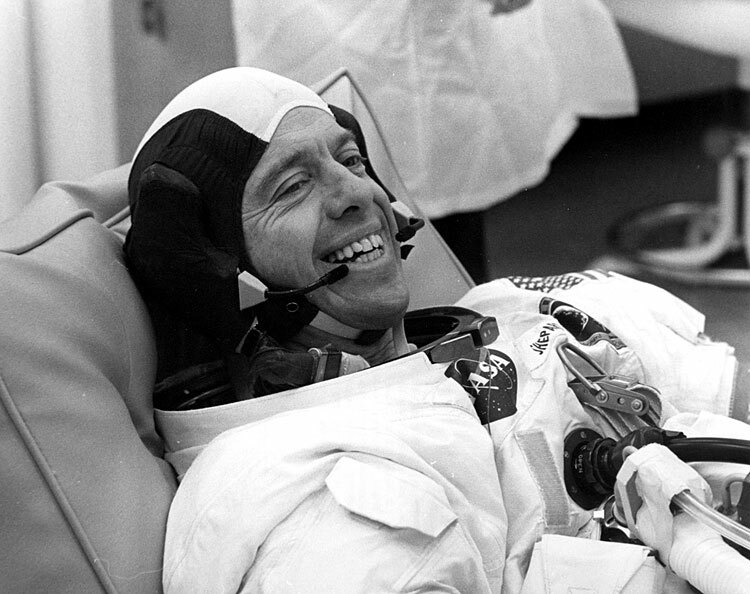 129:24:41 Cernan: Okay, Ed. We got that, now. And we'd like you to put your water Sep(arator) in at number 2 position, if you would please. 129:24:55 Shepard: Okay. Stand by. 129:31:37 Mitchell: Okay. We're ready to start our timer up on the EVA-2 Prep. 129:31:45 Cernan: Okay. And we're pushing them to get an answer on this briefing real quick, Ed. I understand you're ready to push your timer up on EVA-2 Prep. 129:31:57 Mitchell: That's affirm. Of course, we can get that answer any time, Gene; as we go out the door even. 129:32:04 Cernan: Yeah. That's affirm. We're with you for pressing on at this time. And how's your neckrings and wristrings look? Were they in pretty bad shape, dirt-and-dustwise? 129:32:19 Mitchell: I don't think they were. My right wristring was a little bit dirty. The neckring didn't look bad. The left one wasn't bad. And Al's were in pretty good shape. 129:32:43 Mitchell: Okay. Mark. Start timing. 130:01:03 Fullerton: Antares, Houston. Go ahead. 130:01:08 Shepard: Just to keep you advised, we're starting PLSS donning on EVA-2 Prep. 130:17:11 Haise: Go ahead, Antares. 130:17:15 Mitchell: Okay, Fredo. We're at the PLSS comm check portion of our Prep-and-Post (Cue Card). 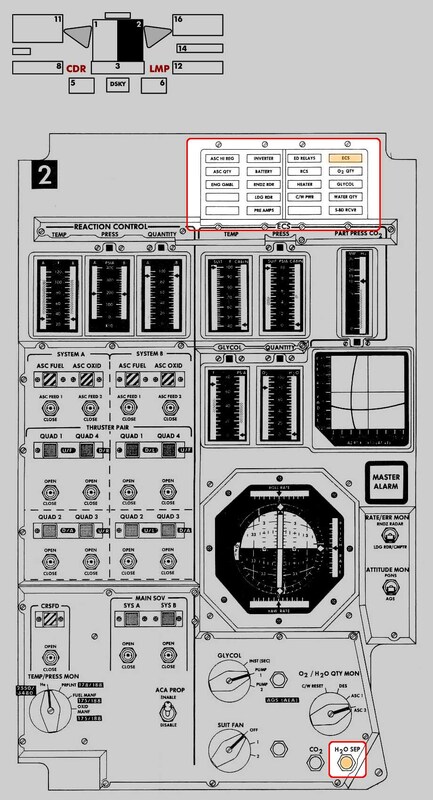 We will follow checklist except we will reverse the LMP('s) and the CDR's audio panel like we did yesterday. 130:17:31 Haise: Okay. And, Ed, we're going to have to hold for about 3 minutes to make the checks here, because we need to do some reconfiguring. 130:18:25 Haise: And, Antares; Houston. 130:18:33 Haise: Okay. And while we got this little bit of wait-time here before you get on the PLSSs all the way, why don't I get you to get your map out and let me give you some changes on the task. 130:18:52 Mitchell: Okay. You want the EVA-2 map out, right? 130:18:54 Haise: That's affirm. (Long Pause) And, you still there, Antares? 130:19:22 Shepard: Affirmative. We're getting the map out now, Fredo. 130:19:25 Haise: Okay. I might give you some general comments. I guess the basic change is due to the need to get back out to the ALSEP and verify the antenna orientation. And I'll have some later instructions for you on that one. And in the process of buying that time, we're going to need to be back at the LM at about 45 to 50 minutes (prior to repress) rather than the nominal 35 to do that job. We're going to have to change in one case - well, actually change what's "documented" to "grab" samples at a couple of places along the way. 130:20:08 Mitchell: Okay. I thought we were going to try to do the antenna job first, Fredo. 130:20:12 Haise: Okay. I guess the rationale, Ed, was that it wasn't really felt that it would save that much time to do it there since y'all had been operating in parallel anyway and it alters our nominal. Plus, with respect to the priorities; it's just desired to save that until last in case we have to cut any more. 130:20:38 Shepard: Okay. Are you getting anything at all from the ALSEP now? 130:20:42 Haise: I guess they are getting signals but they're low signal strength, Al. And the only things that's going to help is if indeed an antenna lead (that is, one of the cables linking the experiment modules with the Central Station) or something physically jarred the Central Station so the antenna is offset from the way you left it. 130:21:09 Haise: They've already tried the switching on all the electronics they had. 130:21:17 Shepard: Okay. We're ready to entertain the changes for EVA-2. 130:21:55 Mitchell: Okay. I've got a grab...Hold it. Fredo, we got a grab sample at site B now. Let's get straight on our term "grab sample." You want no photography at all. Is that affirmative? Or do you want some? 130:22:09 Haise: The photography there will be the pan, Ed. And that'll be it. 130:22:17 Mitchell: Okay. No documentation of the sample at all. 130:22:26 Mitchell: Okay. Press on. 130:22:27 Haise: Okay. Now down to Weird. The same thing there. Grab sample. 130:22:37 Shepard: Okay. Grab sample at Weird. 130:22:43 Haise: Okay. And then basically I've written in here...It's actually what should be on your closeout part of the cuff checklist. But at that time the CDR will go to the ALSEP, and I'll have some instructions to follow on that, Al. And at that point, Ed would proceed to the boulder field - that's north (of the LM) - to take care of the weigh bags with documented samples from that area. 130:23:15 Shepard: Okay. I get the ALSEP (signal strength) back (to normal), and Ed gets the boulders. 130:23:22 Haise: Okay. And that's about it. With respect to the nominal timeline. 130:23:31 Mitchell: Okay. That's simple enough. How many of those big boulders do you want, Fred? 130:23:38 Haise: How many can you fit into the weigh bags? 130:23:46 Slayton: Don't put more than 10 pounds in that 1-pound bag. 130:23:51 Shepard: (Garbled). (Listens) (Garbled) to bring them back like a baby in his arms. 130:23:54 Mitchell: We'll have to pick up the LM and carry it over there. 130:23:58 Haise: How much you been eating lately, Ed? 130:24:03 Shepard: They're not really too bad. They're probably no more than 3 or 4 feet maximum dimension. 130:24:10 Haise: Okay. In about one minute, Kitty Hawk will be going around the corner (to start the next Farside pass) and we won't have our configuration problem, and we'll be able to proceed after that with the comm check. 130:24:22 Shepard: Okay. We're standing by and setting up for it now. 130:27:47 Haise: And, Antares; Houston. We're ready for the comm checks. One other item I did neglect since it wasn't on the map task; at your closeout, we're also deleting the organic sample. 130:28:07 Mitchell: Okay. You'll have to remind us of that, Fred. It's on our checklist. [Journal Contributor Thomas Schwagmeier notes that Fred has mispoken. 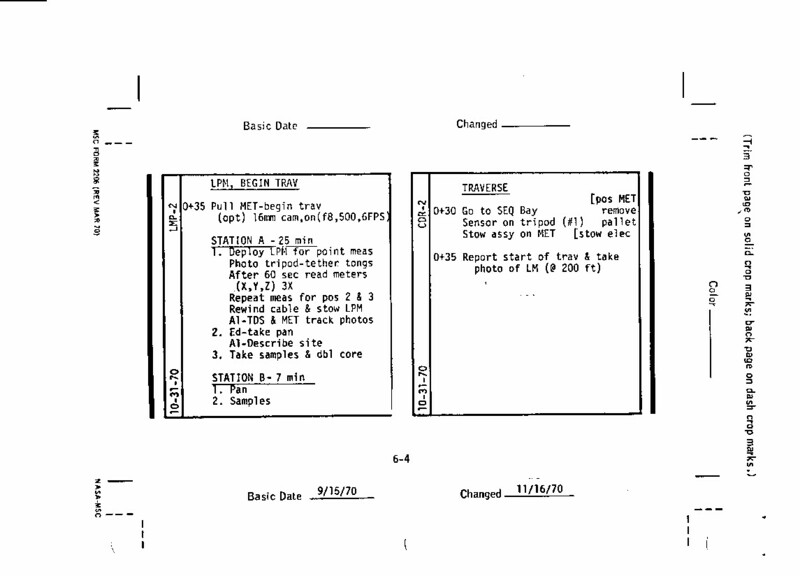 The activity at EVA-2 close-out that Houston wants to eliminate is collection of a "Contamination Sample" from under the LM, which they planned to do during the EVA-2 close-out at 3+34 in both cuff checklists. As for the organic samples, Ed sealed one early in EVA-1 at 115:34:23 and Al is scheduled to do the same early in EVA-2. The subject of the organic sample versus the contamination sample comes up again at 131:28:02. 130:28:13 Haise: Okay, sure will. (Pause) And, Antares; Houston. We'd like Normal Voice. 130:30:47 Mitchell: Houston, Antares. How do you read now? 130:30:50 Haise: I read you loud and clear, Antares. We need you to go back to PM and go from Down-Voice Backup to Normal Voice and then start in again with the FM route. 130:31:05 Mitchell: Okay, I'm in PM now. I'll switch to Down-Voice Backup and back to Voice. 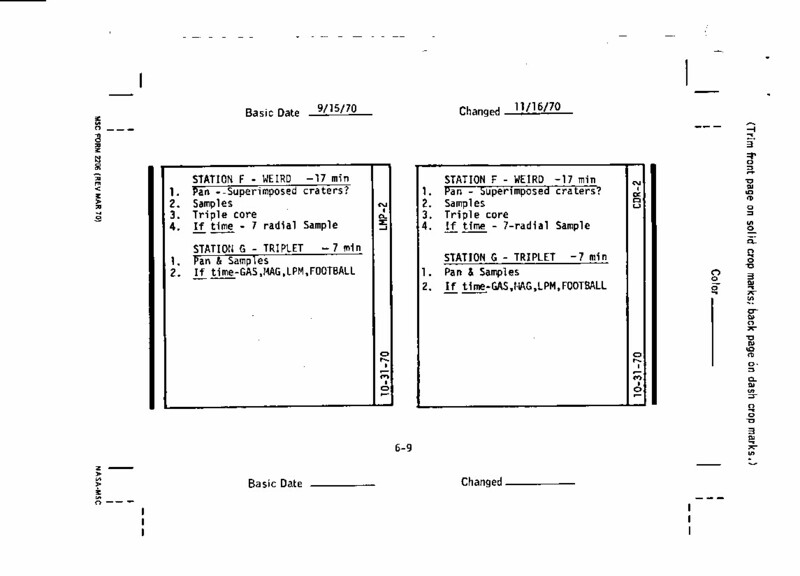 130:31:31 Mitchell: (Static has cleared) Houston, how do you read now? 130:31:34 Haise: Loud and clear, Antares. 130:31:38 Mitchell: Okay, I'm going to FM and close the TV circuit breaker. 130:32:03 Mitchell: (Garbled, probably "Houston"). How do you read now? 130:32:44 Mitchell: Houston, Antares. How do you read? 130:32:50 Haise: Go ahead, Antares. I'm reading you about 3 by 3 now, Ed. 130:32:57 Mitchell: Okay, I'm on FM. The TV (circuit breaker) is closed. Prime-Prime and Voice. Okay? 130:33:05 Haise: Okay, you're coming in loud and clear now. 130:33:27 Mitchell: VOX SENS MAX. (Garbled) T/R, B Receive. Okay, Houston, I'm switching to Secondary now. Secondary Transmitter/Receiver. 130:34:24 Mitchell: (Good comm) Houston, Antares. How do you read? 130:34:26 Haise: I read you loud and clear, Antares. 130:35:21 Mitchell: VHF A (garbled). (Momentary squeal) Your A, T/R, on? (Pause) Your PLSS, Off. (Pause) Okay, it says (garbled) right now. (Garbled). 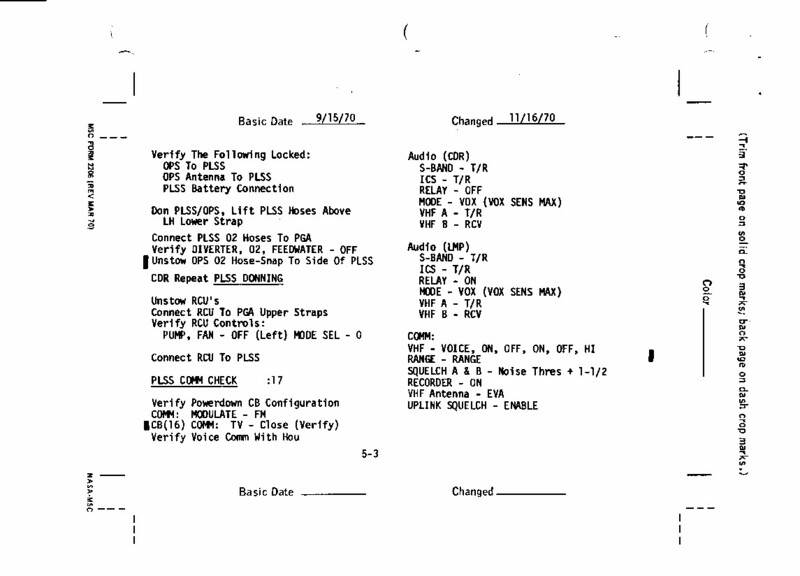 130:35:59 Mitchell: Okay, (Tape) recorder, On; VHF Antenna to EVA. (Pause) All right, Houston, I'm going to PLSS comm. 130:39:35 Mitchell: (No longer squealing) And I read you loud and clear. 130:39:39 Shepard: Roger; and my PLSS O2 is reading eight-five percent. 130:39:42 Mitchell: (Now at the top of the right-hand column of Sur 5-4) Okay. I go B, you go A. 130:39:45 Shepard: Okay, now. (Brief squeal) How do you read? 130:39:52 Mitchell: Loud and clear. How me? 130:39:53 Shepard: Loud and clear. Okay, both AR. (Brief squeal) How do you read AR? 130:40:05 Mitchell: Loud and clear. How me? 130:40:06 Shepard: Read you loud and clear. And I have a tone. 130:40:08 Mitchell: And, Houston. How do you read Ed? 130:40:11 Haise: Okay, Ed. I read you loud and clear. 130:40:16 Mitchell: Okay, Fredo. (Pause) And I have a PLSS O2 quantity of (pause) eighty-seven percent. 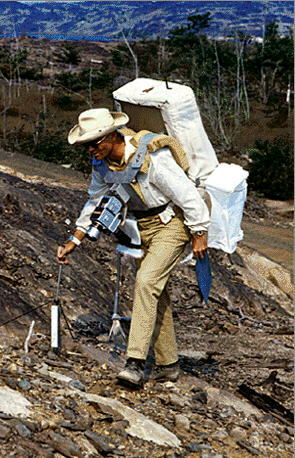 130:40:34 Shepard: And this is Al with a PLSS O2 quantity of eighty-five percent. How do you read? 130:40:40 Haise: Roger, Al. We copied the quantity and you're coming in loud and clear. 130:40:46 Shepard: Okay. We're proceeding with Final Systems Prep. Okay. Verify Cabin Repress ECS breaker. 130:40:55 Shepard: Suit Fan Delta-P (and) Suit Fan 2, Open. 130:40:59 Shepard: Okay; we got a (ECS) caution (light)? 130:41:15 Shepard: It'll take a little while. In the meantime, go ahead; Suit Gas Diverter (Valve), Pull-Egress. 130:41:21 Mitchell: Okay, Suit Gas, Pull-Egress. 130:41:24 Shepard: Cabin Gas Return (Valve), Egress; and Suit Circuit Relief (Valve), Auto. 130:41:31 Mitchell: Egress, and Suit Circuit Relief, Auto. 130:42:15 Shepard: Snap. (Pause) Okay. All your flaps are snapped. No Irish pennants. And the actuator is on (pause) connecting it to the RCU. (Pause) It's connected. 130:42:36 Shepard: And you can put your valve to Suit Disconnect. (Pause) (Offering to reach across) Here, I can do it for you. 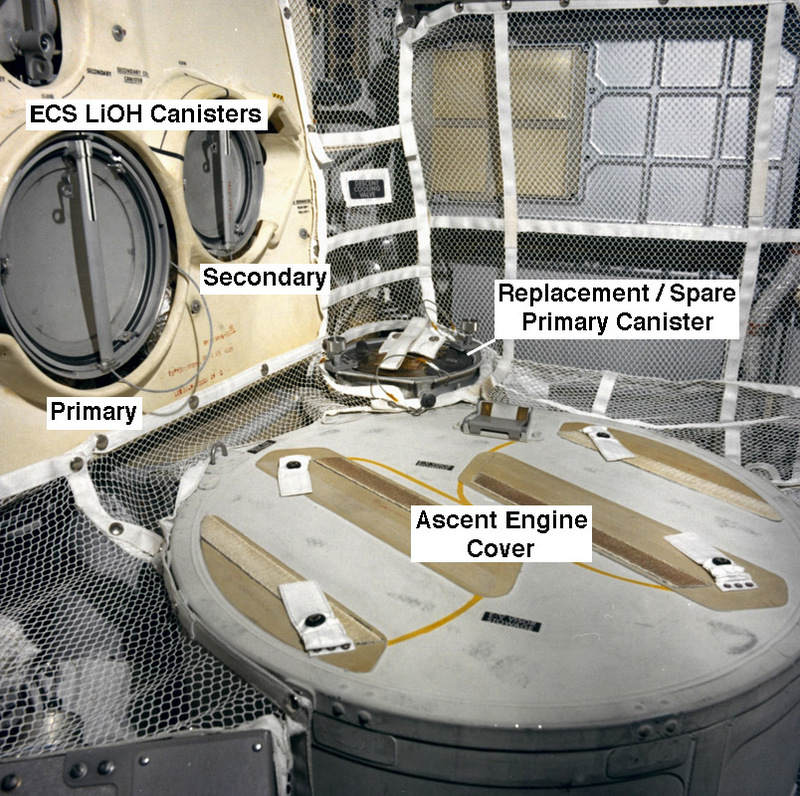 130:42:51 Shepard: Disconnect the LM O2 hoses; let me get those. (Long Pause) Off. It is off. 130:43:13 LM Crew: ECS (Caution light) and Water Sep(arator light) (have come on). 130:43:15 Shepard: Okay, connect the OPS O2 hose. Blue to blue. (Pause) Blue to blue and locked. 130:43:32 Mitchell: Okay. 130:43:35 Shepard: Okay. 130:43:36 Mitchell: The purge valve. 130:43:44 Mitchell: Purge is (in) Low (flow). 130:44:17 Shepard: Okay, you're locked. 130:44:25 Shepard: Okay. PGA diverter valves Vertical. Both vertical. Okay. 130:44:34 Mitchell: (Garbled) and we repeat. Okay. 130:44:40 Mitchell: Unstow OPS O2 actuator. (Pause) (Un)stowed. Flaps are coming closed. (Long Pause) Connecting it. (Pause) Okay. 130:45:11 Shepard: Okay. Suit Isol(ation) Valve to Disconnect. I got it. Okay. 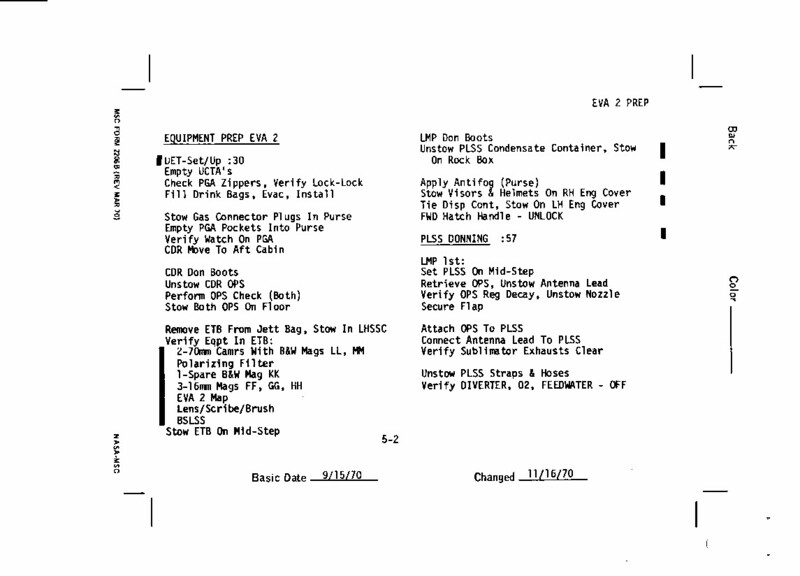 130:45:21 Mitchell: (Reading down the cue card to find their place) "Actuator to RCU...Suit ISOL valve." 130:45:23 Mitchell: (Dis)connect O2 hoses. (Pause) Ouch! (Pause) Okay. 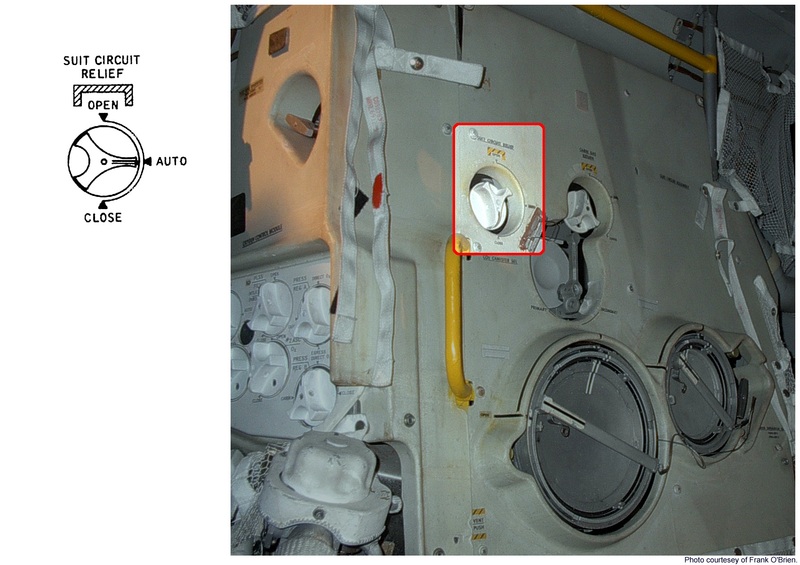 130:45:40 Shepard: Okay, connect the OPS (hose to the) PLSS (means PGA) with the blue(-to-blue) and lock. 130:46:06 Shepard: Locked and Low (flow). 130:46:07 Mitchell: Low. Okay; and locked. (Pause) Okay, it's locked. And the lock is lock-locked. 130:46:26 Shepard: Okay. Diverter valves to vertical. 130:47:26 Shepard: Okay. Shut off the Descent Water Valve. 130:47:31 Mitchell: Descent Water Valve, Closed. 130:47:36 Mitchell: (Garbled) mikes set. 130:47:38 Shepard: Mikes are set. 130:47:48 Shepard: Okay, PLSS Fan, On; vent flag, clear. 130:47:56 Shepard: Vent flag, clear. 130:48:04 Shepard: Okay, you ready for your helmet? 130:48:31 Shepard: Get that in just a minute. Get this first, so we don't...(Garbled) Okay. 130:48:39 Mitchell: Okay. (Pause) Okay. 130:49:24 Shepard: Okay, I believe that's good. 130:49:26 Mitchell: (Garbled). (Pause) Locked? 130:49:54 Shepard: Okay, can you see your (RCU) controls? 130:50:13 Mitchell: Be easier pressurized. Okay, can you reach it? 130:50:30 Mitchell: Okay. (Long Pause) (Garbled). 130:51:03 Mitchell: (Garbled) cable's coming out. (Long Pause) I think it made it in the back. Here we go. 130:51:30 Mitchell: Okay? (Long Pause) Okay; that's latched. (Long Pause) Bags? 130:52:06 Mitchell: Let me look behind now. (Garbled) look at the other side. Yeah, I was afraid of that. (Pause) Okay, now you are all tucked down. 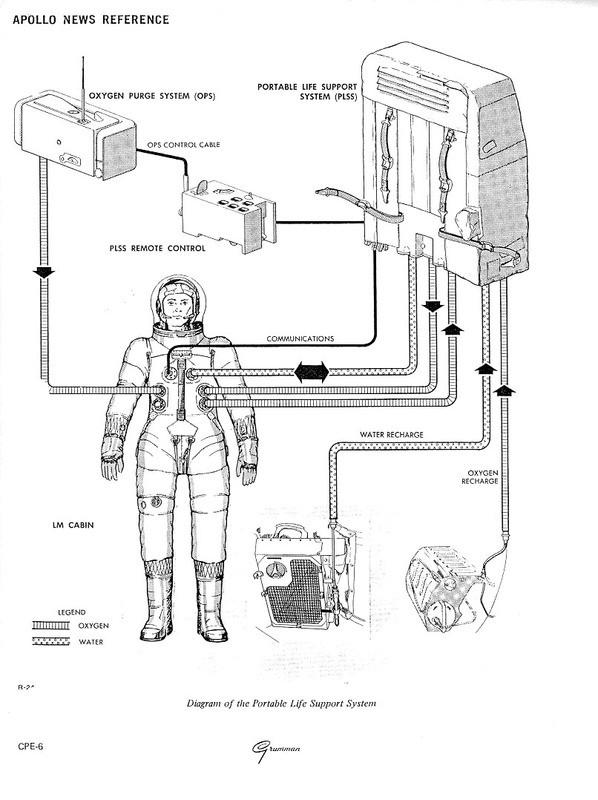 130:52:23 Shepard: Okay; LCG is positioned as required; open the LCG Pump breaker. 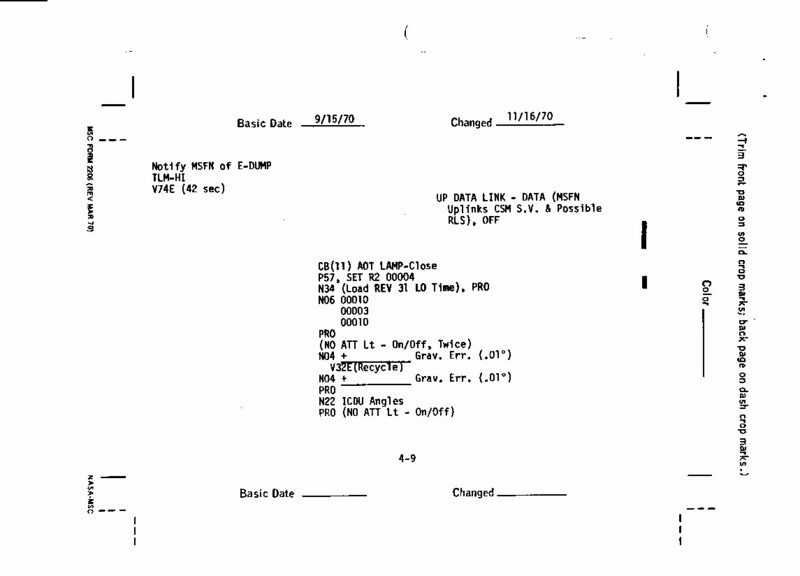 130:52:33 Shepard: Well, (garbled) let me to go ahead and disconnect mine (that is, his LM water). 130:52:37 Mitchell: Okay. (Pause) Okay. 130:52:47 Shepard: Okay, go ahead. I'll just put these hoses in the back, here. 130:52:50 Mitchell: Okay. You're dragging this one. Why don't you hook it up while you're at it. (Pause) I'll hold it for you. Go ahead. 130:53:04 Shepard: Okay. I think (pause) that ought to do it. (Long Pause; grunts) Okay. (Pause) (Garbled). 130:54:00 Mitchell: It went. (Pause) Can't do two things at once. (Long Pause) Get it locked? 130:54:48 Shepard: Okay, you ready? 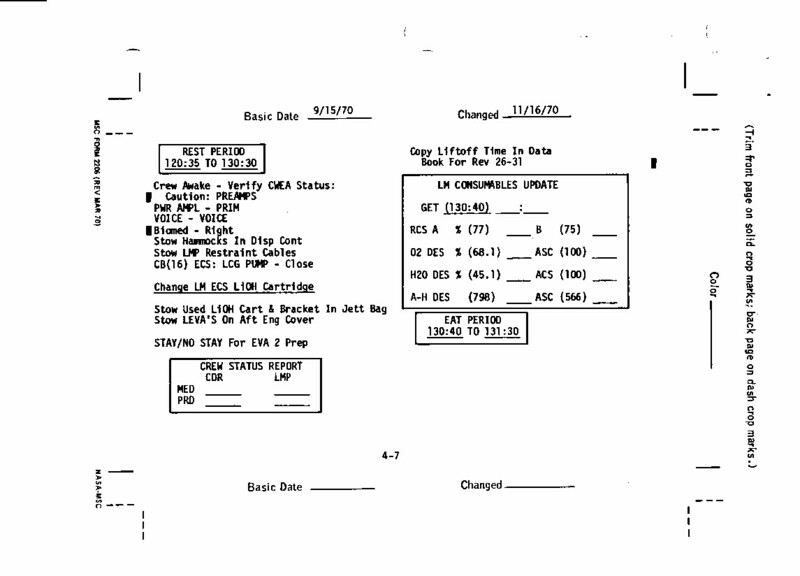 130:54:50 Mitchell: Okay, LCG Pump (circuit breaker). (I'm) opening (it). 130:55:36 Shepard: Here, I'll get them for you. (Pause) Okay, you're locked. 130:56:37 Mitchell: Okay, O2 connectors, three. 130:56:40 Shepard: Turn around. They're locked; red locked, blue locked. 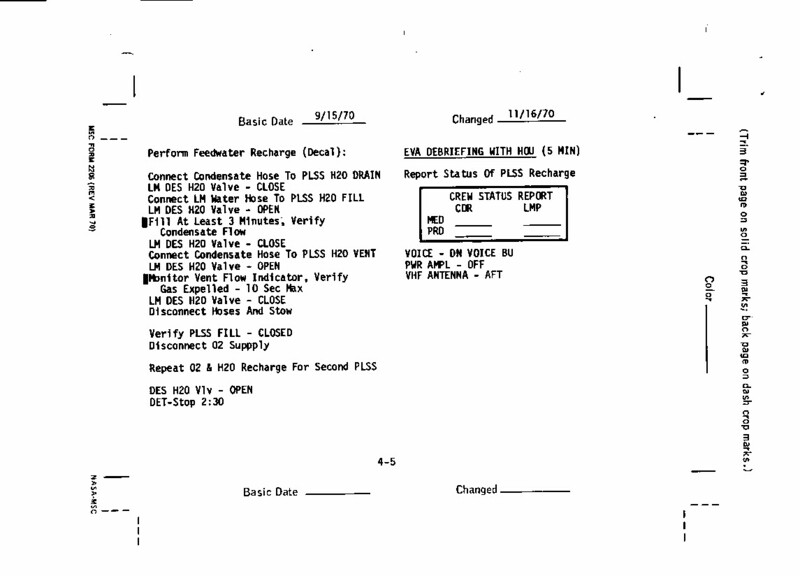 130:56:46 Mitchell: (Reading page 5-5) Purge valves, one. 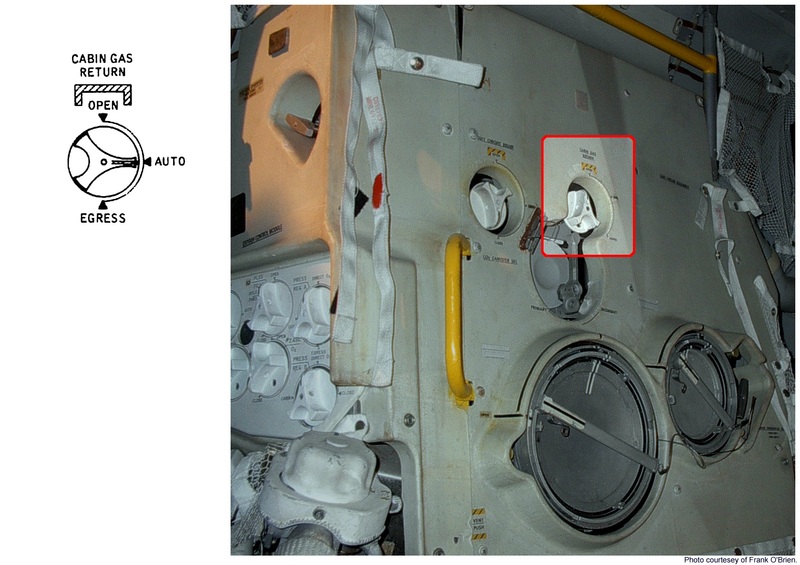 130:56:48 Shepard: Purge valve is locked. 130:56:49 Mitchell: Water connector, one. 130:56:51 Shepard: Water connector's locked. 130:56:52 Mitchell: Comm connector, one. 130:56:54 Shepard: Comm connector's locked. 130:56:55 Mitchell: Okay; read them for me. 130:56:59 Shepard: Okay, helmet and visor aligned and adjusted. 130:57:02 Mitchell: Okay; I verify that. 130:57:03 Shepard: My torso tiedown is okay. 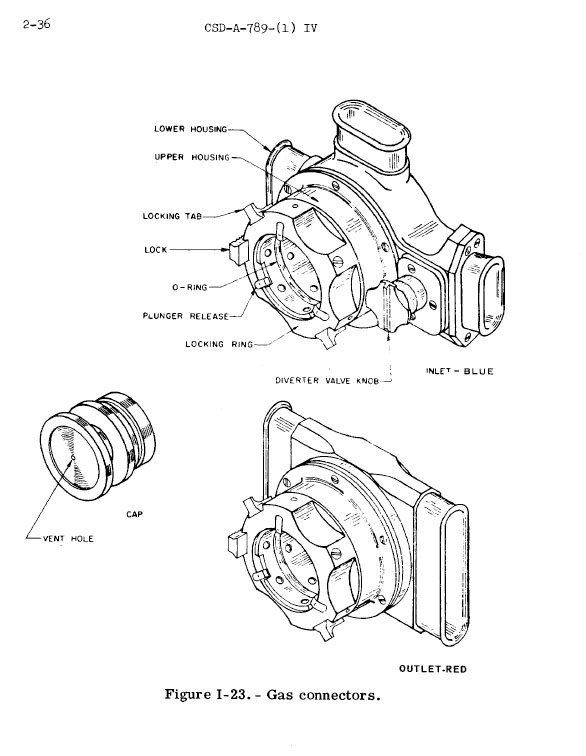 Three O2 connectors. 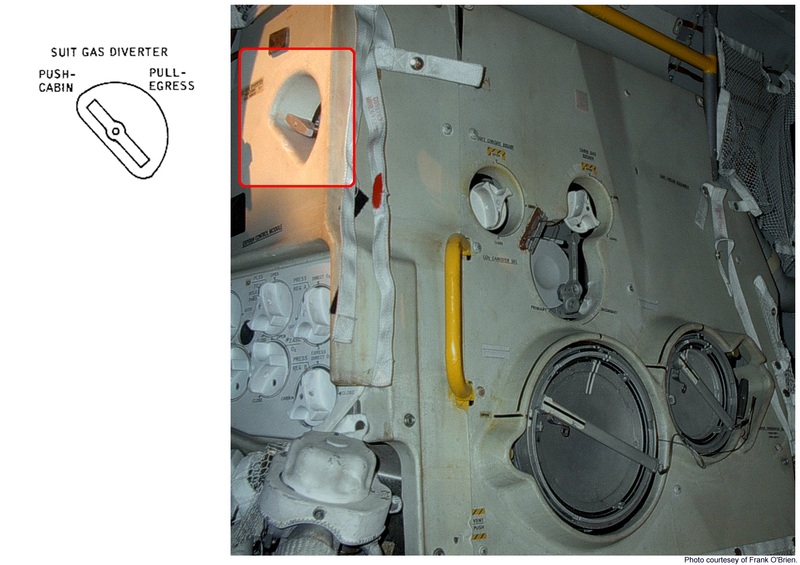 130:57:09 Mitchell: Okay, three O2 connectors, verified locked and lock-locked. 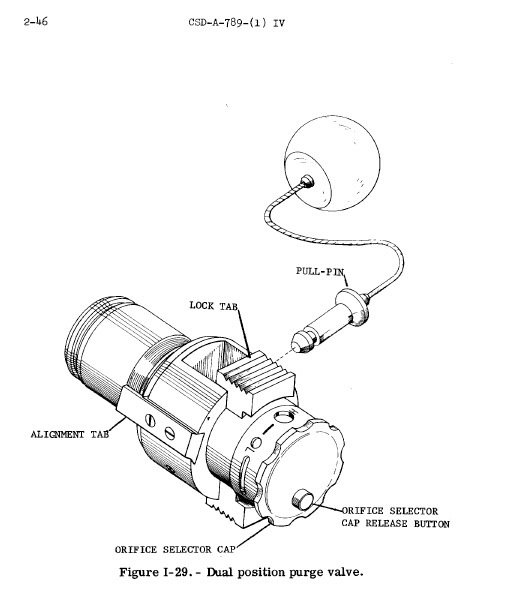 130:57:14 Shepard: One purge valve. 130:57:15 Mitchell: One purge valve; in, and lock-locked. 130:57:20 Shepard: And comm connector. 130:57:21 Mitchell: Locked and locked. 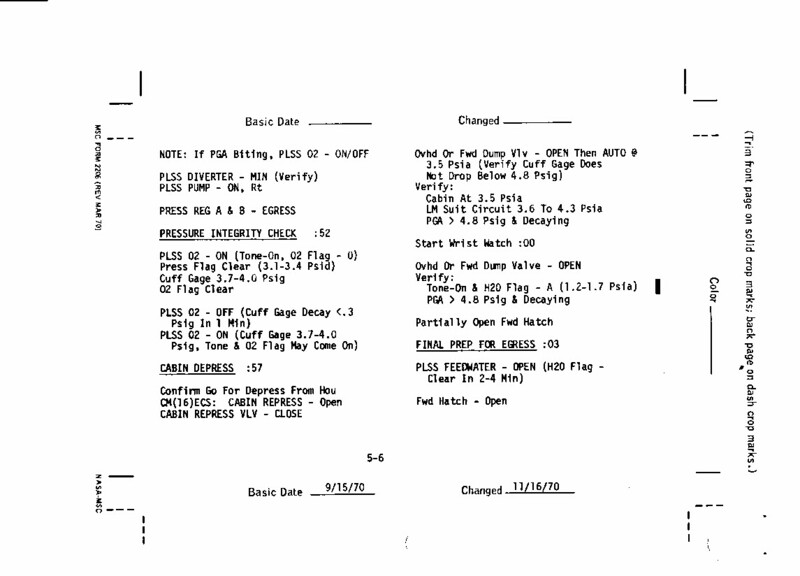 130:57:24 Shepard: Take a look at the EVA circuit breakers. 130:58:07 Shepard: Okay; they're verified. 130:58:08 Mitchell: Mine are all verified. Let's don EV gloves. 131:00:12 Shepard: Bring your (wrist)ring around a little bit. (Long Pause) I think that did it. Now try it. 131:00:50 Mitchell: No. There's something catching on it, Al. 131:01:00 Shepard: Take it off. 131:02:23 Mitchell: Okay. Got it. 131:02:25 Shepard: Okay. Four wrist locks locked. Glove straps adjusted. Verify PLSS Diverter in Min. 131:02:35 Mitchell: Okay. Diverter in Min. 131:02:36 Shepard: And then PLSS (LCG) pump On. 131:02:52 Mitchell: Okay. (Garbled). Press Regs A and B. 131:02:55 Shepard: Press Regs A and B to Egress. 131:03:04 Shepard: Okay. Pressure integrity check. Turn your PLSS O2 On. Should get tone on. O2 flag, O. 131:03:16 Mitchell: O2, On. There we go. 131:03:23 Mitchell: There's the tone. O2 flag O. 131:03:28 Shepard: Press flag P (sic). 131:04:08 Shepard: Press flag cleared (at) 3.1 (psi). 131:04:10 Mitchell: And mine's clear. 131:04:12 Shepard: Okay. (Pause) And I'm stable at 3.7 (psi). 131:04:22 Mitchell: I'm not quite there, yet. Okay. There it is. 131:04:29 Shepard: And the O2 flag is clear. 131:04:31 Mitchell: Mine's clear. My O2 is off. 131:04:33 Shepard: Okay. And we're stabilized at 3.7. 131:04:37 Shepard: And O2 coming Off. 131:04:38 Mitchell: 3.7, starting the check. 131:05:41 Mitchell: Okay. There's forty (seconds past the minute). I have about 0.22 (psi pressure change during the integrity check). 131:05:51 Shepard: Okay, Houston; 0.22 drop on the LMP, and 0.15 drop on the CDR. Okay. PLSS O2, On. 131:06:02 Haise: Okay. We copy. 131:06:07 Mitchell: Okay. PLSS O2 is On. (Pause) And O2 flag clear, tone is On. 131:06:18 Shepard: Okay. And the pressure is back up to 3.7. 131:06:21 Mitchell: Okay. (Pause) Houston, we're ready for Cabin Depress. 131:06:27 Haise: Okay. We're Go, Ed. 131:06:44 Mitchell: Cabin Repress breaker's open. 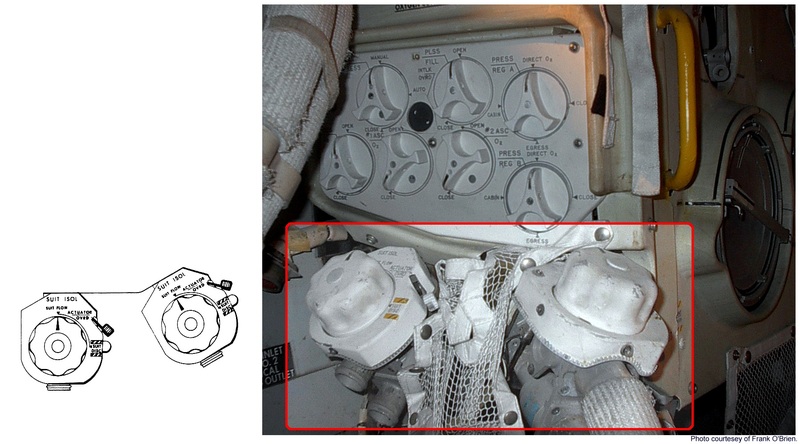 131:07:01 Mitchell: Forward or the overhead (dump valve)? 131:07:03 Shepard: I'll get the forward. 131:07:09 Shepard: Okay. Going down (to get the valve). 131:07:14 Mitchell: Okay. We're going to drop...Go to Auto at 3.5. 131:07:21 Mitchell: Okay. There's 4.5. (Pause) 4. (Pause) 3.5. 131:07:31 Shepard: Okay. We're back in Auto. Cuff gauge reading 4.9. 131:07:35 Mitchell: And so is mine. 131:07:42 Shepard: Cabin at 3.5. 131:07:44 Shepard: LM suit (circuit), 3.6 to 4.3. 131:07:46 Mitchell: It's at 4.5. 131:07:47 Shepard: And PGA is greater than 4.8, and it's coming down. 131:07:52 Mitchell: And mine's coming down. Okay. 131:07:55 Shepard: Start the wrist watch. Okay, Houston. Time zero. Mark. 131:08:01 Haise: Okay. We got a start. 131:08:22 Mitchell: There's two pounds. 131:08:45 Mitchell: One pound. (Long Pause) Four-tenths. 131:09:46 Mitchell: Okay. (Pause) Water flag A. (Long Pause) Okay. Turn PLSS feedwater On. (Long Pause) Feedwater, On. 131:10:51 Shepard: Can you reach the feedwater for me? 131:10:53 Mitchell: Yeah. Okay. Just a second. Let me...(Long Pause) Okay. 131:11:15 Shepard: Okay. Got a water flag A. 131:11:17 Mitchell: And mine is cleared. 131:12:00 Mitchell: Oh, I think I see what my suit problem is, Al. (Pause) I've got a broken cable in my wrist. 131:12:13 Mitchell: Yeah. See, I can't control the right hand. 131:12:22 Mitchell: Keeps pulling back to the inside on me. 131:12:24 Shepard: Pull it there? 131:12:26 Mitchell: I can pull it, but I can't turn it this way and make it stay there. See, it's doing it by itself. 131:12:32 Shepard: Okay. We have both water flags clear. 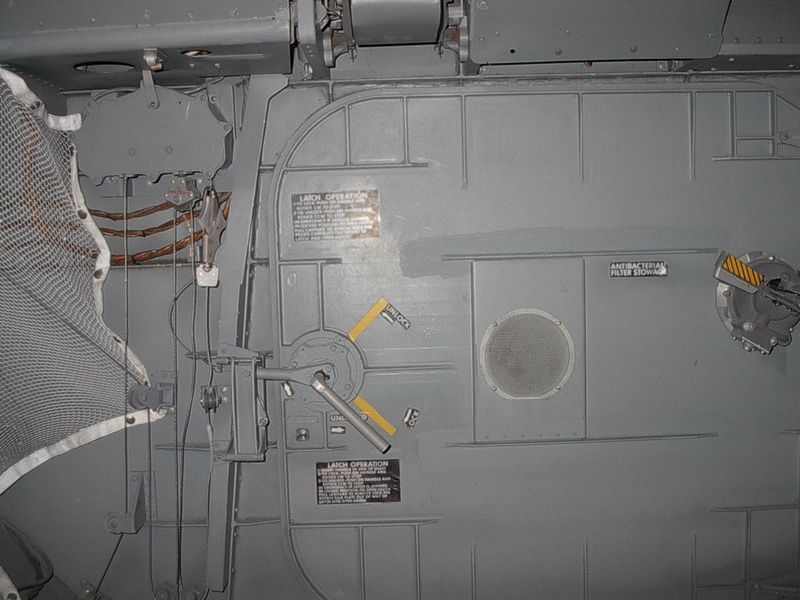 Hatch is coming open. 131:12:40 Shepard: And you want to get my (PLSS/OPS) antenna on the way out?